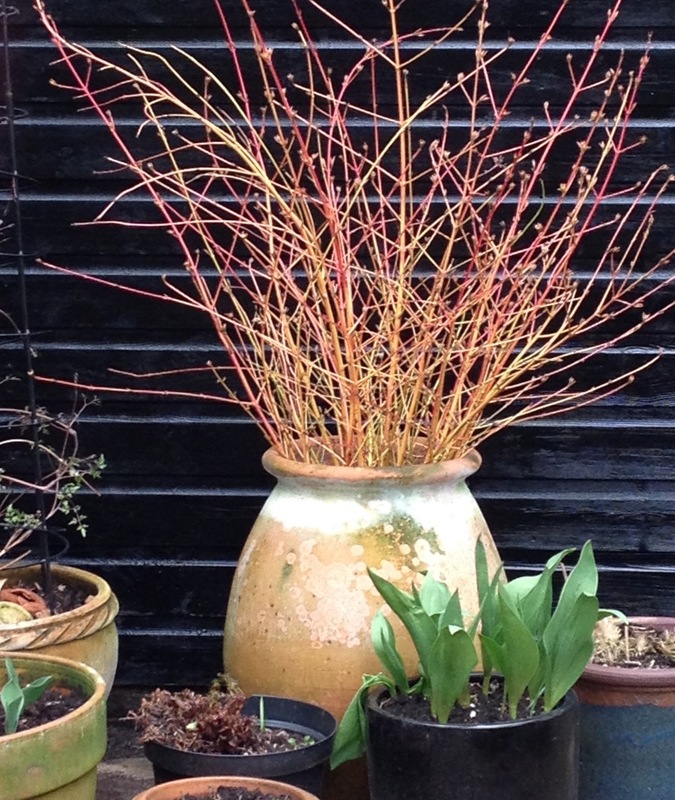 If you haven't pruned your Cornus (dogwood) yet, now really is the time! It's a job I always enjoy, as it gives me the opportunity to get creative with the resulting stems, which in the case of Cornus 'Mid-Winter Fire' are bright orange and gold. I place them in a container against the background of a black shed, or in a bare patch in the border. They can also be used to support perennials, or direct the growth of clematis as it struggles to reach the wires on the fence. I've seen them simply stuck into the ground at RHS Wisley garden, in a long wavy line between bulbs. You are only limited by your imagination, and although the bright colour will only last a few weeks, it's a good return on a few minutes effort. The benefit to the plant is that the best colour stems are produced on the new growth. Feed and mulch the shrub after pruning almost to the base. Although it seems drastic, you'll soon see the start of new leaves and stems, promising a gorgeous display of butter-yellow leaves in autumn, and those vibrant stems again in winter.